Simple’s demise was announced today. It is the summer solstice… June 21, 2011. The brand began on Friday the 13th of December 1991. The end will be at the end of this year. So the brand will make it to twenty. I’ve been gone from it since 1996 or so. It was my baby so I am a bit sad. The word came as I was watering my garden though… and it is tuesday… and it was the middle of the day… so I suppose I have very little to be sad about actually. The Hindu’s believe that when you die… you reincarnate as something better. Hmmm. During my ownership we produced 572 different ads. This one up above is one of my favorites from 1993. Our campaign was one of the first modern anti-advertising campaigns… but DD&B was who started this type of advertising with VW in the 1960’s. 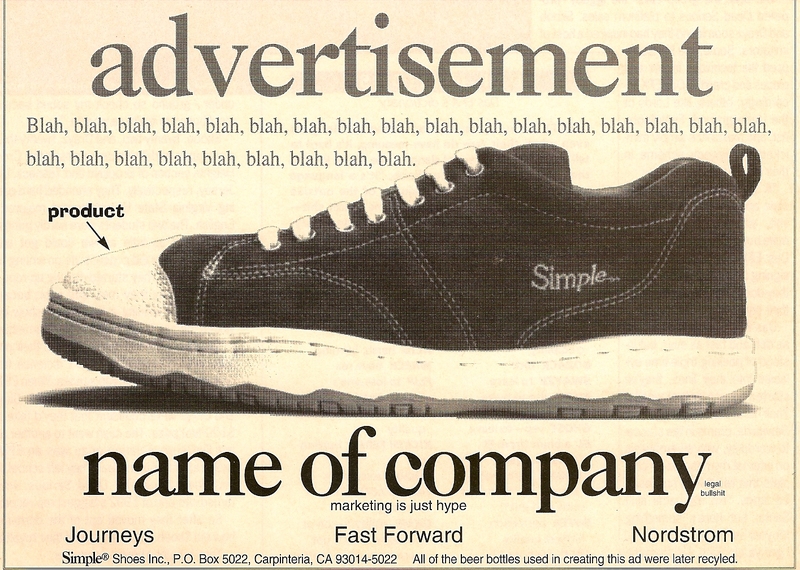 I loved writing our ads and drawing the shoes. I wasn’t so hot on all the travel though. The purity of a concept often goes way off track when put in the hands of a big corporation. It is the way of the world. You built the vehicle and handed the keys off to someone that had the bankroll and the desire to have what you built. But without the vision and passion, the machine eventually ends up on blocks behind the shed. Simple rocked…and it gave you an amazing ride. A ride personally that is far better for you than it probably would have been if you were still at the helm. You built a dream machine…a fantastic thing. You did good…someone else crashing it can’t take that away…ever. Thanks Randy… nice metaphor by the way! PS… the date has been corrected in the copy… I left in 1996… not 2006. Oops. I discovered Simple shoes on accident… shopping with my sister in 2010. I bought two pair and toss them in my closet (so ashamed to say that). But this past month, I developed cellulitis in my feet and I needed shoes with a thick sole. I dug them out and fell in love! And I’m so so sad they aren’t around anymore! They are the only shoes that keep my pain at bay! Awesome shoes that I grew to appreciate too late! I hope someone picks up the line!